Answer "What dogs are strong?" This "What dogs are strong?" answer was viewed by 1257 visitors. The harsh nature of the North has managed to create the appearance, character, and temperament of sled dogs. Low temperatures and strong winds made their hair thick and hard, but with a thick and soft undercoat. 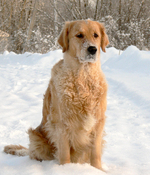 Deep snow requires having durable bones, long body and paws and incredible physical power. Various strong northern dogs are still used to move people and cargo. But now, it has become just a hobby. Sled dogs – are incredibly strong breeds with an athletic body, extraordinary stamina, and warm fur. For example, the Malamute. But each of these northern breeds has its own unique character and psychology. Huskies, for example, are very friendly, but pretty cunning. Samoyeds are also very friendly and look like bears. These dogs have a really huge wish to work. Malamutes are pretty social dogs, but they like to be leaders, so get ready to conflicts. Malamutes also have good vocal skills, so you can talk to them whenever you want and they will answer you with funny sounds. RU: Какие собаки самые сильные?